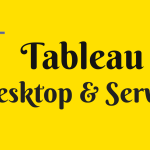 Tableau is a top online reporting and dashboard tool which helps in viewing and interpreting the data. It can generate fascinating visuals of performance metrics, staff productivity, client demos and results through bar diagrams, pie charts, GEO-coded time mappings, videos based on time, trends, storyboards and much more. Tableau’s powerful Business intelligence now offers add-ons dashboards SaaS service. One can instantly get an access to a set of dashboards in astonishing visuals, animations, and interactive formats. Creating a customized distribution list for various sets of dashboards and schedule them to receive the reports automatically through emails in PDF. Online interactive dashboards with data filters, filtering, drilling, sharing and CSV level export. Reports accessibility online anywhere from a Desktop version, uploading reports to the server anytime. R and python are complementary tools used for integrating with Tableau. This enables you to choose the correct tool for your work. 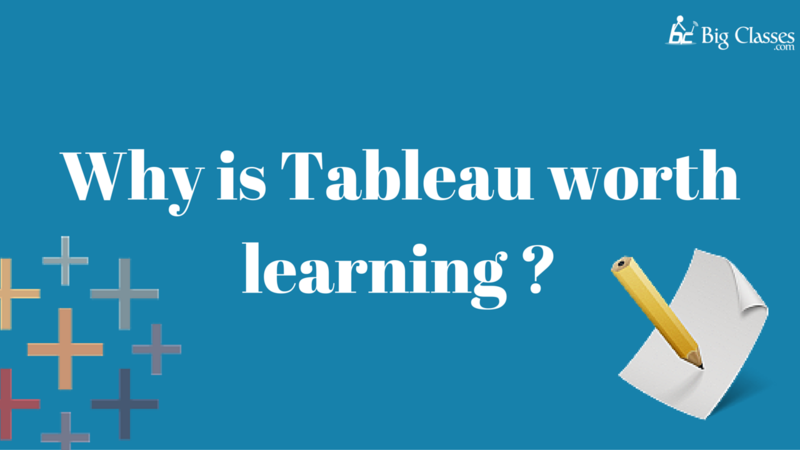 What are the benefits of learning Tableau? Tableau is used to classify and store the huge data. It allows one to examine and structure the data, analyze and convert the same into valuable information. Tableau family consists of interactive visualization products concentrated on Business Intelligence. It’s a modern perspective of data statistics, involving creation and study of representing data visually. Tableau tries to put into practice the best performance based on the human insight of imagining data visually. Creating data visuals immediately and it switching among the types to easily find the model that suits your data. A wide range of choice is there in selecting the models to represent the data. Data representation can be done by selecting any form in which you want to showcase it i.e. by graphics, tables, maps etc. Even the beginner can come up with the acceptable visual appearances. The user interface is well designed to customize the view within a few clicks versus various views. It’s simple and supple execution allows the user to customize and represent the data with the help of menu’s enclosing several options. Learning tableau enhances the growth of any organization by scrutinizing its data in an appropriate way and analyzing the reasons for the drawback of the organization/business. Within a short period of time, one can gain expertise and implement the same at their workplace. Data visualization is an excellent career choice. Predictions are made that it can become a pivotal myriad for different industries/sectors. And the career with Tableau skills is accelerating. 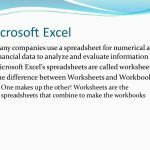 Most of the software companies are preferring this skill for clarity in their data analysis and promoting it as a good career option. Tableau gives best results when it works in accordances with the other BI tools like ETL, BI, and DWH and generates mappings; visualizations etc. 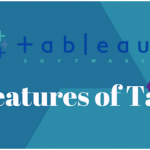 Tableau’s adorable feature being, it allows non-programmers and business people to generate hassle-free data sets and quickly explore and generate powerful plots with pretty graphs, animations, and interactivity. It is very helpful in giving presentations to advertising and financial clients. Integrating Tableau with R definitely, takes your career on Top. It’s easy manipulation in various business streams and great interactivity and API’s have exceeded the expectations of the organizations. Tableau desktop is an authoritative data discovery and exploration application which allows receiving the answers in seconds. This can not only visualize and explore various views; it even combines multiple databases and generates the reports accordingly. 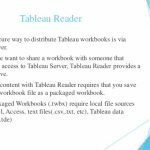 Tableau server helps in publishing the dashboards with Tableau Desktop and shares the same within your organization.